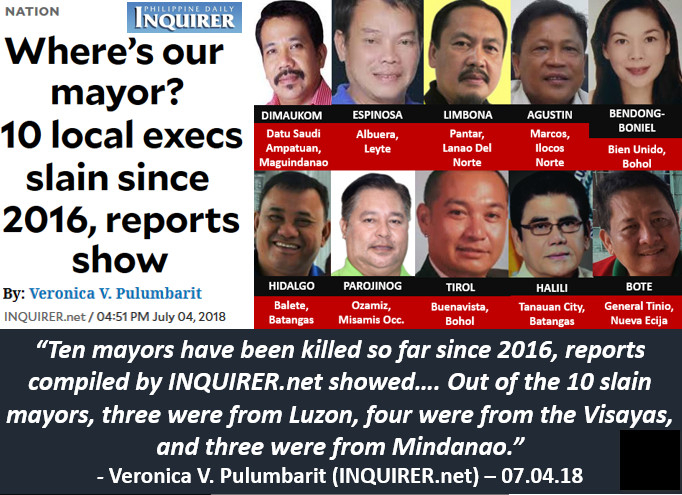 Ten mayors have been killed so far since 2016, reports compiled by INQUIRER.net showed. This month alone, two mayors in Luzon were killed in two days: General Tinio, Nueva Ecija Mayor Ferdinand Bote and controversial Tanauan Mayor Antonio Halili, known for his “Walk of Shame” campaign where he made criminal offenders walk around the city. Out of the 10 slain mayors, three were from Luzon, four were from the Visayas, and three were from Mindanao. All of the mayors, except one — Albuera Mayor Rolando Espinosa Sr. — were incumbent local executives when they were killed. Only Espinosa was not holding office when he was killed as he happened to be in jail on suspicion of being involved in the drug trade. Of the 10 slain mayors, only one was a woman, Bien Unido, Bohol Mayor Gisela Bendong-Boniel, who was allegedly shot dead by her husband and thrown off the sea. 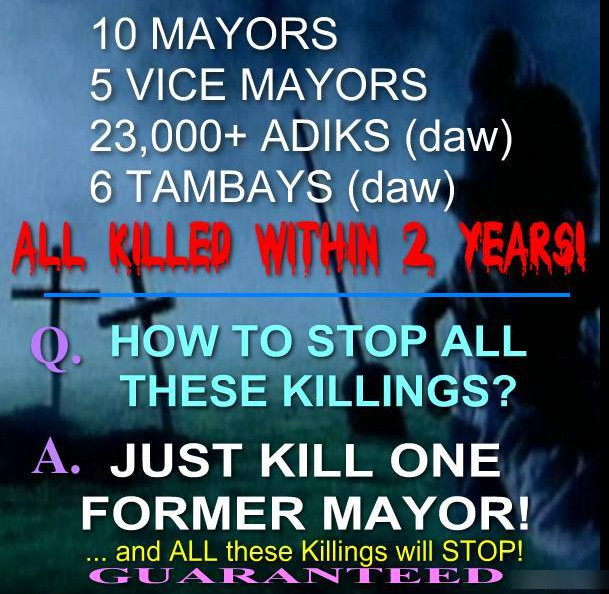 Of the 10 slain mayors, only Boniel’s body has yet to be found. He died in October 2016 in an alleged shootout with government operatives at a checkpoint in Makilala, North Cotabato. Dimaukom was known as the “mayor who loved pink” as he had a fondness for the color. He had a mosque built in the color pink. He also had the municipal hall renovated and had it painted in pink. Albuera, Leyte Mayor Rolando Espinosa Sr. was killed inside his jail cell at the Leyte Sub-Provincial Jail in Baybay City in November 2016 as he reportedly resisted the search warrant being issued against him. Espinosa was in jail for alleged violation of the Comprehensive Dangerous Drugs Act of 2002 and for illegal possession of firearms and ammunition. Pantar, Lanao del Norte Mayor Mohammad Exchan Limbona was ambushed in Iligan City in December 2016. The mayor was in a vehicle with his wife and daughter when shooters opened fire at them. Marcos Mayor Arsenio Agustin was killed by a lone gunman in his hometown in Ilocos Norte in June 2017. The mayor was walking toward his parked vehicle after inspecting a water impounding project. Bien Unido Mayor Gisela Bendong-Boniel was allegedly shot in the head by her husband, Bohol Board Member Niño Boniel. A suspect, Riolito “Etad” Boniel, told police that Niño’s group dumped her body into the sea. Etad said he operated the boat that carried the body of the slain mayor. He also accompanied authorities and divers to the area where they allegedly threw the body. The mayor’s remains have yet to be found. Balete Mayor Leovino Hidalgo was shot during a local sports event in Barangay Poblacion at around 10:30 a.m. on June 10 last year. The suspects were reportedly on board a white van. The mayor was rushed to Metro Lipa Medical Center but died along the way. Ozamiz City Mayor Reynaldo Parojinog and 14 other people, including his wife Susan, were killed in a police raid in July last year. He was allegedly being served a search warrant when his security personnel attacked. The Parojinogs, an influential clan in Misamis Occidental in Mindanao, were on the narco list. In 2014, an assassination attempt was carried out against Mayor Ronald Tirol of Buenavista, Bohol province but he survived. In May this year, the Buenavista Mayor was killed at a cockpit arena in his town. One of the three suspects in Tirol’s killing was allegedly also involved in the 2014 assassination attempt against him. Tanauan City, Batangas Mayor Antonio Halili was shot dead by a sniper during a flag ceremony at the city hall on July 2, 2018. Halili was a controversial mayor as he made drug suspects participate in a walk of shame in the city. This practice was declared unconstitutional by the Commission on Human Rights. In November 2017, Halili was linked to the illegal drug trade. The mayor was stripped of his powers over the local police but Halili refused to surrender. Picture of slain Mayor Ferdinand Bote displayed by a photo studio across the town hall. Motorcycle-riding gunmen killed General Tinio Mayor Ferdinand Bote on July 3, 2018. The mayor was leaving the National Irrigation Administration office in Cabanatuan City on a Toyota Fortuner when he was shot several times, apparently with the use of a short firearm at around 4:50 p.m. on Tuesday. He sustained multiple wounds and was declared dead on arrival at a nearby hospital. MANILA, Philippines (4th UPDATE) – Mayor Ferdinand Bote of General Tinio, Nueva Ecija, was shot dead on Tuesday afternoon, July 3. This was confirmed to Rappler by Philippine National Police (PNP) chief Director General Oscar Albayalde, citing the initial police report of Cabanatuan City cops. According to the police report, Bote was onboard his Toyota Fortuner along the Barangay Imelda portion of Maharlika Highway at around 4:50 pm when he was ambushed by a motorcycle-riding suspect. "He (Bote) was repeatedly shot with the use of [a] short firearm by [an] unidentified suspect," the police report states. The 57-year-old mayor was rushed to nearby MV Gallego Cabanatuan General Hospital, but was declared dead on arrival. The suspect, police said, immediately fled to the east. In a statement, Presidential Spokesperson Harry Roque vowed there would be a "fair and thorough investigation" into Bote's killing. "We assure everyone that we would discharge the state obligation for every murder. 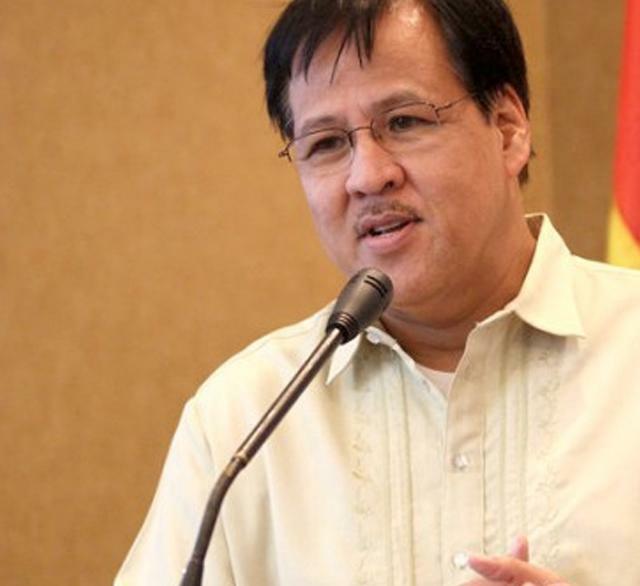 We will spare no effort in getting to the bottom of this latest violent crime," Roque said. Bote's ambush happened a day after another mayor, Antonio Halili of Tanauan City, Batangas, was killed by a sniper during a flag ceremony at the city hall. President Rodrigo Duterte claimed Halili was involved in the drug trade. bakit si Hebert Bautista buhay pa? madalas ang pot session ni Hero Bautista sa QC City Hall? ay ...... nasa rehab na pa kasi nahuli sa drug test. Malacañang on Thursday, July 5, said the President has ordered law enforcement agencies to investigate and arrest all those behind the recent killings of locally-elected officials in the country. “Imbestigahan at hulihin ang mga pumapatay, ‘yan po ang malinaw na instruction ng Presidente,” Presidential Spokesperson Harry Roque Jr. said during a Palace press briefing. “Importante na panindigan ng Estado ‘yung kanyang obligasyon na talagang bigyan ng katarungan ‘yung mga biktima. Dahil kung hindi, paulit-ulit po itong mga patayan na ito. Kinakailangang ibalik talaga ‘yung takot sa mga puso’t isipan ng mga pumapatay,” he added. Secretary Roque announced that the government, through Department of Interior and Local Government (DILG) Officer-in-Charge Eduardo M. Año and Philippine National Police (PNP) Chief Director General Oscar Albayalde, has already conducted a dialogue with the Union of Local Authorities of the Philippines (ULAP) to address the issue. “Nagpahayag po ng alarm at kabahala ang ULAP sa mga napapatay na mga lokal na opisyales,” the Palace Spokesperson noted. For one, he said ULAP requested to have participation in the vetting process for the government’s “narco-list,” which reveals the names of officials allegedly linked to illegal drugs. According to Roque, the officials want to be notified whenever certain names are added or removed from the list. 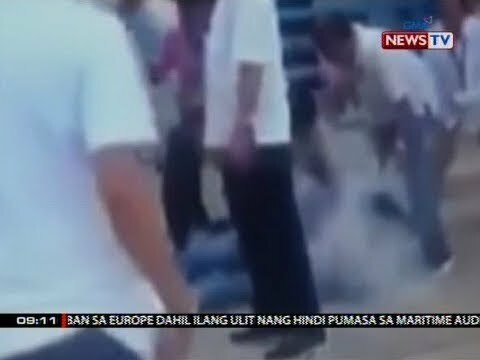 “Ang gusto lang mangyari ng ULAP ay magkaroon sila ng partisipasyon doon sa vetting bago mailagay ang pangalan ng isang locally elected official. Dahil sabi nila, may mga political reasons din why some would want some names to appear,” he explained. Sec. Roque said the DILG and the PNP would study ULAP’s request, although he noted that the agencies stood by the veracity of the existing narco-list upon citing notable improvements in the manner by which the Philippine Drug Enforcement Agency (PDEA) maintains it. “They have now moved towards a central database for all narco-personalities. So apparently, all agencies now coordinate with PDEA because PDEA has the mandate under the law to implement the Dangerous Drugs Act. All intelligence information are now submitted to PDEA and it is incumbent upon PDEA now to verify these intelligence reports,” Roque stated. Meanwhile, Malacañang stressed that President Rodrigo Roa Duterte remains open to conducting peace talks with the Communist Party of the Philippines-New People’s Army (CPP-NPA), provided that they accept the government’s conditions. Secretary Roque said the conditions include conducting the peace talks in the Philippines and refraining from collecting revolutionary taxes. The CPP-NPA also has to agree to encamp its members while the talks are ongoing, with their needs provided for by government. “Patuloy pa rin ang paghangad ng kapayapaan ng ating Presidente, pero hindi naman po pwede na sila pa ang magdidikta kung paano tayo makakarating sa kapayapaan,” Roque said, adding that the government is also considering holding localized peace talks as an alternative. He said local government units (LGUs) have to await further instructions from the Cabinet Cluster on Security, which will finalize the guidelines for the localized peace talks. The Cluster is set to conduct a meeting on July 12. “I am pleased to announce that one of my pet bills in Congress has been signed into law. This is Republic Act No. 11037,” Secretary Roque said. The measure aims to combat hunger and undernutrition among Filipino youths by institutionalizing a National Feeding Program for undernourished children in public day care, kindergarten, and elementary schools. “It is really a sin that while in the past, the problem was how to spend the annual appropriations budget, there are around 6 million Filipino children who still suffer from acute malnutrition,” Roque noted. LP siguro nagpapapatay sa mga yan LOL! MAINGAY kayo kapag may Sunod sunod na may namamatay na MAYOR pero yung sunod sunod na pagkamatay ng mga batang ito dahil sa DENGVAXIA tahimik kayo!!! MANILA, Philippines (3rd UPDATE) – Alex Lubigan, vice mayor of Trece Martires in Cavite, is the latest local government official killed since President Rodrigo Duterte assumed power in 2016. He was shot dead on Saturday, July 7, while on board his vehicle, according to an initial spot report. He was killed on the same week Ferdinand Bote, mayor of General Tinio in Nueva Ecija province, was ambushed by motorcycle-riding men in Cabanatuan City on Tuesday, July 3. Another mayor, Antonio Halili of Tanauan City in Batangas province, was shot dead a day earlier, during a flag-raising ceremony at the city hall. Pamplona Vice Mayor Aaron Sampaga was killed by unidentified gunmen on August 5, 2016 in Cagayan province. He was 3-term Pamplona mayor before his sister Arnie Angelica Sampaga was elected mayor during the May 2016 elections. Dimaukom was one of the local officials on the drug list of President Duterte. Albuera, Leyte Mayor Rolando Espinosa Sr was killed in a reported shootout inside his jail cell at the Leyte Sub-Provincial Jail in Baybay City on November 5, 2016. Authorities alleged they were serving a search warrant when he resisted. Espinosa arrested by police in October 2016 in connection with violations of the Comprehensive Dangerous Drugs Act of 2002 and for illegal possession of firearms and ammunition after a PNP raid in his house yielded 11 kilos of suspected methamphetamine worth an estimated P88 million, and high-powered weapons. 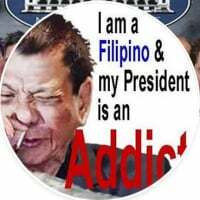 He and his son, Kerwin, were among the first alleged drug personalities named Duterte. Datu Saudi Ampatuan Vice Mayor Anwar Sindatuk was entertaining guests inside his home in Maguindanao when an unidentified suspect shot him at close range on November 26, 2016. Initially elected as the town's number one councilor, Sindatuk assumed the post of vice mayor after the previous vice mayor, Anida Dimaukom, assumed the post of mayor to replace the slain Dimaukom. Pantar, Lanao del Norte Mayor Mohammad Exchan Limbona was killed in an ambush in Iligan City on December 29, 2016. He was with his wife, daughter, and two escorts when an unidentified group open fired at his vehicle in Barangay Dalipuga. Local police said that possible motive for the killing could either be politics or rido, a family feud. Marcos town Mayor Arsenio Agustin was gunned down by unidentified men in his town in Ilocos Norte on June 3, 2017 while he inspecting a water impounding project. He and his driver, Mark Valencia, were declared dead on arrival. Bien Unido, Bohol Mayor Gisela Bendon-Boniel was believed to have been abducted and killed on June 7, 2016 allegedly by her husband, Bohol Board Member Niño Rey Boniel, over marital issues. Her remains are yet to be found. Balete, Batangas Mayor Leovino Hidalgo was gunned down by unidentified men on June 10, 2017 during a local sports event, according to a GMA News Online report. Ozamiz City Mayor Reynaldo Parojinog and 14 others, including his wife Susan, brother Octavio Jr, and sister Mona, were killed in a police raid on July 30, 2017. State agents were allegedly serving a search warrant when Parojinog's security personnel attacked. The Parojinogs, an influential clan in Misamis Occidental, are among those named by Duterte in his list of local government offiicals allegedly involved in the drug trade. Roxas town, Oriental Mindoro Vice Mayor Jackson Cinco Dy was gunned down by unidentified men on September 22, 2017, according to a Philippine Daily Inquirer report. The assailants fled using a motorcycle. Ronda, Cebu Vice Mayor Jonah John Ungab was killed when unidentified gunmen opened fire at his vehicle on February 19, 2018 along S. Osmeña Street, Cebu City. He is the lawyer of suspected drug lord Kerwin Espinosa. Buenavista, Bohol Mayor Ronald Lowell Tirol was shot at close range by an unidentified man while inside the town's cockpit arena on May 27, 2018. He was declared dead on arrival. Tanauan City, Batangas Mayor Antonio Halili was shot dead on July 2, 2018 during a weekly flag-raising ceremony in front of city hall. He grabbed headlines for implementing a “walk of shame” for drug suspects back in 2016, which was slammed by the Commission on Human Rights because parading suspects was unconstitutional. In November 2017, after the Duterte administration linked him to illegal drugs, the National Police Commission stripped Halili of powers to supervise the local police. Halili refused to heed calls for him to surrender. Mayor Ferdinand Bote of General Tinio, Nueva Ecija, was killed by motorcycle-riding gunmen on July 3, 2018 while coming from the National Irrigation Administration office in Cabanatuan City. He was declared dead on arrival at a nearby hospital. 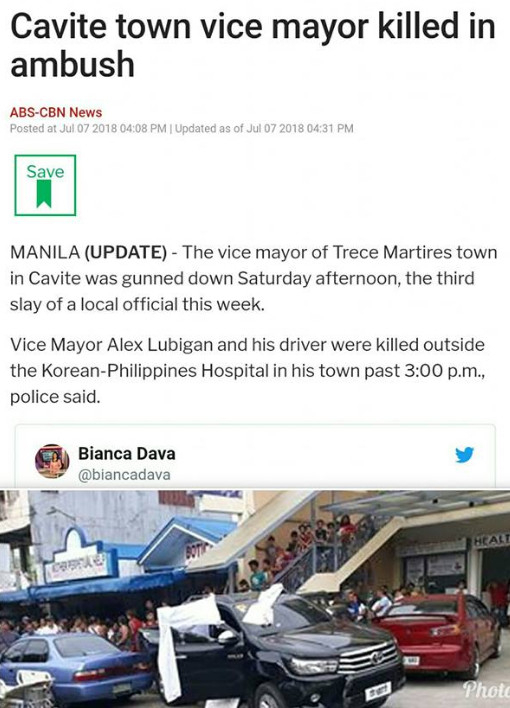 Vice Mayor Alex Lubigan of Trece Martires, Cavite was shot dead on Saturday, July 7, in front of the Korean Hospital in Indang Road, Barangay Luciano. An initial spot report stated that he was on board a black Toyota Hilux when a black Montero fired at the victim's vehicle "and resulted in his unfortunate death." DOBLE KAYOD ANG MGA DILAW. KAILANGAN IBALIK SA MALACANAN ANG MGA KAMPON NG MGA DILAW. LET THE AQUINO LEGACY LIVE ON! Dont forget the three priests. MANILA, July 11 (Reuters) - Two motorcycle-borne gunmen on Wednesday killed the vice mayor of a southern Philippine town, the fourth local official assassinated in a week, including one President Rodrigo Duterte said may have had links to illegal drugs. A BARANGAY councilor in Lipa City, Batangas was gunned down on the same night that a former vice mayor of Santo Tomas town, also in Batangas province, was wounded in a separate gun attack. Romel Cuento was shot dead by two motorcycle-riding suspects around 6:35 p.m. Saturday, July 14, while he was talking to a former barangay official in Purok 6A. Senior Inspector Hazel Suarez, public information officer of Batangas Police provincial office, said Cuento was declared dead on arrival at a local hospital. He sustained several gunshot wounds in the body. Suarez said police conducted hot pursuit operations against the gunmen who fled towards the town of Padre Garcia. About an hour later in Sto. Tomas town, former vice mayor Ferdinand Ramos of Santo Tomas town was wounded after an unidentified gunman shot him as he was walking home in Barangay Poblacion 2. Ramos survived the attack at 7:25 p.m. Saturday but sustained a gunshot wound in the face. Cuento was the fourth local government official gunned down in Luzon this month, after Tanauan City Mayor Antonio Halili, General Tinio Mayor Ferdinand Bote and Trece Martires City Vice Mayor Alexander Lubigan. Police have said there were different motives in these killings amid concerns raised by government critics on the emerging culture of violence in the country. Wala yan. Mas matindi pa rin sa panahon ni PNoy. DILG Secretary pina EJK dahil may alam sa drugs.. hindi na nakuntento, pati ang lone witness, pinatay rin. KAGAGAWAN YAN NG MGA DILAW. UNITED LIBERAL OPPOSITION PARTY. ULOL. SOUNDS GOOD. MANILA, Philippines — The Philippine National Police on Monday has named the supposed central figure behind the killing of General Tinio, Nueva Ecija Mayor Ferdinand Bote. PNP Director General Oscar Albayalde identified Christian Saquilabon, a contractor in the province, as the alleged mastermind in the murder of Bote two weeks ago. Saquilabon was tagged by the alleged gunmen, who confessed to the crime. Chief Superintendent Amador Corpus, Central Luzon police director, said a project called the Minalungao Tourism Convergence Zone appears to have been a factor in the killing of the town mayor. Minalungao National Park, known for its limestone walls and clear water, is located in General Tinio and is one of the popular tourist destinations in the province. Corpus added that Special Investigation Task Group Bote has identified five of the eight suspects—Saquilabon, and gunmen Florencio Suarez and Robert Gumacay, Arnold Gamboa and Jun Fajardo. Suarez and Gumacay were arrested at a checkpoint in Del Gallego, Camarines Sur last week. Gamboa, on the other hand, surrendered to authorities. Saquilabon, Fajardo and two unidentified gunmen are still at large. Bote was gunned down last July 3 just after leaving the National Irrigation Administration office in Cabanatuan City. Nag-meeting ang mga a..bnoy. Alam na alam kung ano ang susunod na agenda. Chorus and mga kinang inang. DAVAO CITY — The national president of the Vice Mayors’ League of the Philippines (VMLP), an organization of all vice mayors of cities and municipalities in the country, has called on the public to refrain in quickly linking the killings of vice mayors to President Rodrigo Duterte. VMLP national president Donnabel Joy F. Mejia of Magsaysay, Davao del Sur on Saturday said “any official can be victim of a political feud,” adding that the cases on the slay of Trece Martires, Cavite Vice Mayor Alex Lubigan and Sapa-Sapa Tawi-Tawi Vice Mayor Al Rashid Mohammad Ali are isolated cases. “Hindi maganda na i-connect siya with Digong kasi ang nangyari were only isolated cases (It is not good that we connect it to the President because the incidents were isolated cases),” she said. Mejia said the murder of the two vice mayors could be related to politics in their respective towns. “Iba yung nangyari sa Trece Martires, iba yung nangyari sa Zamboanga City (The incident in Trece Martires is different from Zamboanga City),” she said. She added that officials could be victims of similar cases due to “political feud” in their areas and these could not be blamed to the President. “When I went to Trece Martires, sinabi nga nu’ng asawa ni Vice Mayor Lubigan, sinakyan lang ito kasi may namatay (na) mayors. Parang sinakyan lang yung pangyayari (When I went to Trece Martires, the wife of Vice Mayor Lubigan said there are people riding on the issue because of the killings of mayors),” she said. Mejia said even high-ranking local officials who were killed including Tanauan City, Batangas Mayor Antonio Halili and Gen. Tinio, Nueva Ecija Mayor Ferdinand Bote, had already received threats from their enemies. She said the VMLP has already asked the Philippine National Police (PNP) for security detail but PNP chief Director General Oscar Albayalde advised vice mayors to hire private security personnel from an accredited agency. Inimbestigahan mo kasi ang drugs boss, na EJK ka tuloy.